I wanted something different for dessert this Shabbos and for whatever reason, my mind went to the stash of Kool Aid that's been sitting in the cupboard here for over a year. And the only flavour of Kool Aid that counts, as far as I'm concerned, is Strawberry. Feel free to make these with any colour you want! Anyway, an image of these swirly cookies swirled into my mind and I knew exactly how I was going to make them. All I needed was a decent sugar-cookie recipe that didn't rely overly much on butter. I've used a couple of pareve sugar cookie recipes in the past, including this one from Couldn't be Parve, which uses margarine, and these ones which use shortening. But here in Israel, I don't like the taste of the margarine, there are no "healthier" margarines available, and shortening simply doesn't exist. My substitute has become coconut oil, or (sometimes) half and half margarine and coconut oil. So I started looking around for recipes... and found another one from Couldn't be Parve looked absolutely perfect. I wasn’t consciously looking for a vegan recipe, though I was delighted by the idea that we could nibble on the dough to my heart’s content! seems to have worked out just fine, as promised. It seemed like a pretty small recipe, so I decided to make two batches -- one pink and one plain. Unfortunately, I didn't take pictures of the process, but basically, you make two identical rectangles, lay one on top of the other, and roll it up like a sleeping bag. 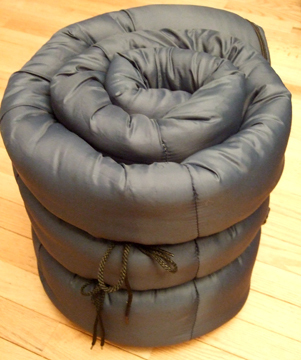 Here, a picture of a sleeping bag. That should give you the idea. I chilled the dough after rolling, as I usually do, but that was a mistake -- this dough slices much better when it's not chilled as it firms up too much in the fridge / freezer and will get too crumbly to slice cleanly. I made the recipe exactly as written (original recipe here! ), weighing the flour (200g) and coconut oil (30g). I made the recipe twice rather than doubling it. Go slowly when rolling and dough is less likely to crack. Be generous with parchment paper when flattening and rolling! Before putting cookies the oven, I brushed them with coconut milk as she suggests, and sprinkled them with demerara (coarse brown) sugar because it’s the closest thing I can find here to sprinkling sugar without going to a specialty baking store. They were lightly done at 10 minutes, and probably a nicer colour, but I like really crispy cookies, so did most for an extra few minutes. They don’t spread much during baking, so I was able to fit 16 on a pan instead of my usual 12. Best if served to little girls who are entranced by all things pink and pretty.